It’s Tuesday, which means it’s time for me to answer your chicken-related questions! A million thanks to everyone who sent in questions – if I did not get to it this week, I will next week! LIKE THIS PODCAST? HERE’S THE REST OF THEM! Hi there, and welcome to session 24 of What the Cluck? 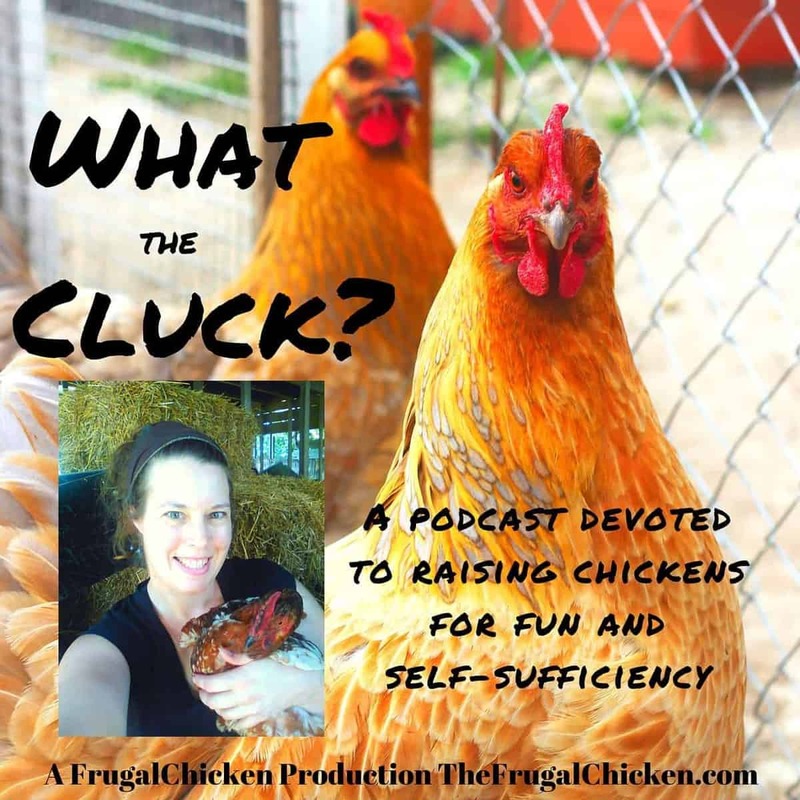 !, a podcast devoted to keeping chickens for fun and self-sufficiency. I’m Maat from FrugalChicken, and today is the day that I take your questions. A million thanks to everyone who submitted, and due to time limitations, I can only take 5 questions, but if your question isn’t answered today, rest assured I’ve taken note, and will try to answer them in next Tuesday’s episode. 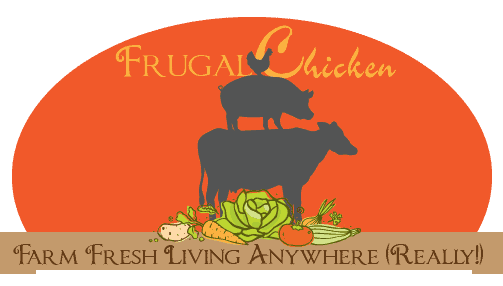 Just as a reminder, if you would like to submit a question, you can shoot me an email at editor@thefrugalchicken.com or contact me over social media. You can find me on Facebook at TheFrugalChicken.com/Facebook. So, today we talk about what fruits chickens can eat, and we also talk about some other poisonous foods, how to train your dog to stop attacking your chickens, about whether Jersey Giants are a good dual purpose breed, and whether beak trimming is a good idea. This will be a valuable episode and by the end of it, I hope you’ll feel a little more knowledgeable about our feathered friends. Just as a reminder, you can get this episodes show notes at TheFrugalChicken.com/Podcast24, that’s podcast with the numbers 2 and 4. Are there any fruits that are not good for chickens? Luckily, most fruits are okay, but there are some to stay away from. Don’t feed avocado flesh, pits or skins which contain the toxin persin, which is a fungicidal toxin present in the avocado. It is generally harmless to humans, but when consumed by chickens in large quantities it is dangerous. In chickens, it can cause an increased heart rate, tissue damage to their hearts, difficulty breathing, it can effect their feathers, and high doses cause them to asphyxiate, or stop breathing, with death approximately 12 to 24 hours after consumption. Stay away from tomato leaves and eggplant leaves. So tomatoes and eggplants are part of the nightshade family, and both contain something called solanine, which is poisonous to people and chickens. It’s a naturally occurring substance that can be fatal to your chickens, so avoid feeding tomato and eggplant leaves to your chickens as well as immature fruit. Just for your own reference the solanine in the plant is part of its natural defense. Avoid apple seed, as well as pits from apricots, cherries, peaches, pears and plums which all contain trace amounts of cyanide. Just for clarification, the flesh is fine, and it’s only the seeds that are an issue. So next on our list is rhubarb, which contains something called oxalic acid, which can inhibit calcium absorption, leading to bone issues, nutrient imbalance, and problems with egg shell quality. Now, the thing about this is that spinach, beet leaves, and things like swiss chard are related to rhubarb and therefore also have large amounts of oxalic acid. So, avoid feeding these items to your chickens in large amounts or avoid them altogether. If your chicken grabs a nibble here or there, it’s probably not a big issue, but if they’re ingesting large quantities, you’ll need to double check they’re absorbing calcium correctly. So, there’s always the question about whether you can feed citrus to your chickens, and there’s varying opinions on this. So, this would include things like oranges, grapefruit, lemon, limes, etc. Personally, I haven’t seen any evidence that citrus is poisonous or bad to feed your chickens, and certainly if anyone has a study they can point me to, I would love to read it. But the thing about citrus is even when offered, my chickens turn their beaks up at it as does pretty much every animal on the farm so I’m not very concerned either way personally. Like anything, if you want to feed it, then just make sure you do it in moderation, and remember that table scraps should comprise no more than 10% of their diet. Now a word about potatoes. Green potato skins contain larger quantities of solanine, which we’ve already discussed. White potatoes that have been cooked shouldn’t cause an issue, I’ve personally fed them to my chickens although I never feed human food in large quantities, but it’s the peels you should avoid. Personally, I would avoid all potato peels since it’s impossible for the average person to tell if there’s enough solanine in it to do harm to your chickens. Also avoid feeding the vine and leaves to your chickens. So some other things you should avoid feeding your chickens are onions, things like chocolate, which no animal besides a human needs anyway and dried beans. Sprouted beans are fine for your chickens. The act of sprouting also kills the poisonous toxins. So, sprouted beans, fine. Dry or under-cooked bean, bad. 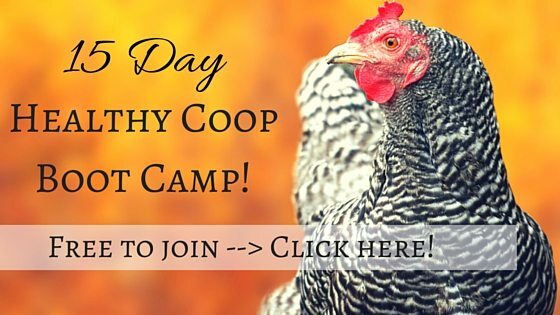 What’s the best way to get a young dog to leave the chickens alone? Now, for the record, I’m not a dog trainer, and my advice is based solely on my experience. Our dog was really bad when it came to attacking our chickens, and we were actually never able to train him out of it. My recommendation is to find a way to keep your dog and your chickens separate, and to keep the chickens in a predator proof coop and run. With our dog, once he started killing chickens, it was like a light switch turned on, and he became a predator. He got the taste of blood, so to speak, and we just weren’t able to train it out of him. Even if we tied him up, if a loose chicken came near him, it was toast. So, we just began keeping the hens in a secure coop that he couldn’t break into. Frequently I see a piece of advice online that I don’t agree with, and that is to tie the chicken your dog killed around its neck for a few days to teach the dog to not do it again. There are people who swear by this, and although it might work for them, I don’t recommend it. I think this is unsanitary for you and your household, and disrespectful to the chicken. Also, based on my experience in certain parts of the US, you might land yourself in some legal hot water. Some areas have strict laws regarding the treatment of dogs, and really, I just recommend staying away from this idea. Just keep your hens and your dog separate. So the next question on our list is whether the New Jersey Giant breed is a good dual purpose breed, and the short answer is yes. Jersey Giants are good layers of brown eggs, and they get very large for a chicken, males get to be about 13 pounds, while females get to be around 10 pounds. So, for a homesteader, this is a very good breed to have, and personally, I might just get some males for myself as meat birds. So, if you’ve never heard of Jersey Giants, these are a large breed of chickens with black feathers. They were developed in New Jersey during the 19th century as a replacement for turkeys, which as you probably know can grow very large and it can be unwealdy to butcher an animal of that size. So, Jersey Giants seemed a good substitute. They’re also a good breed for you to breed sustainably. Currently, they are listed as potentially endangered by the Livestock Conservancy, the breed is on their “Watch” list. So, you’d be doing the breed as well as yourself a solid by raising them. 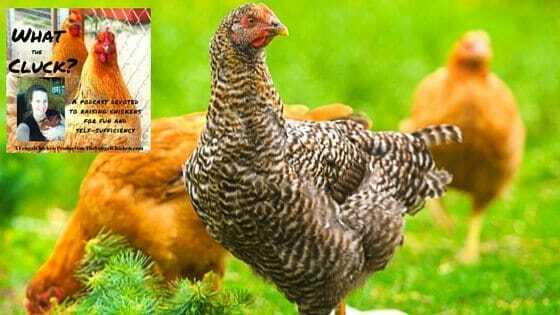 One thing to bear in mind is that they do eat more than other chickens, and in my experience, it pays to feed your birds well since the quality of both the eggs and meat, as well as their size if you’re particularly interested in raising them for meat, is dictated by the quality of their diet. I’ve seen meat heritage breeds that were allowed to forage for the majority of their diet, and they turned out small and not worth butchering. So that’s something to keep in mind. The hens are good layers in winter, and the breed itself is known for being cold hardy and docile, which is always a good thing. So, my answer is yes, if you want a good dual purpose breed, then go with Jersey Giants. So our next question is whether beak trimming hurts chickens and whether its necessary. So, the short answer here is that unless you’re planning to keep a lot of chickens in a small space then beak trimming is not only unnecessary but cruel. And the bottom line is you should not have a situation where you need to keep a lot of chickens in a small space. Either downsize your flock or get a bigger area for them to live in. Your chickens should have 4 feet square space per bird if they’re allowed to free range or have a large run, or if they are not allowed to free range then your coop should have 10 square feet of space per bird. So when the beak is trimmed, what happens is the tip of the beak is sliced off and then allowed to heal. The result is a shorter beak with a dull end that can’t be used to hurt other birds. This is something they do in factory farming where they’re cramming large quantities of birds in a small space and they need to take the extra measure of clipping off the beak because the birds get stressed by their environment and start developing negative behaviors like feather picking and beating each other up. It really has no place in the backyard flock, nor in the egg industry really. I personally believe this is a cruel practice that robs the bird of the beak they developed through evolution, so clearly it has a purpose. Birds with clipped beaks cannot forage very well, because the ends of their beaks are too blunt to effectively dig up food. When it comes to eating a daily ration you might provide them, you’ll need to offer food in deep dishes to make sure they can actually eat the food you’re providing for them since they’ll have a harder time grasping the food with a blunt beak. Similarly, chickens with trimmed beaks have a harder time drinking water. They also can’t clean themselves well, since the tip of the beak helps grab things like mites and lice from their feathers. They also cannot defend themselves well against predators, and it’s not that the beak will really help them if they’re caught by a dog, for example, but it’s all they got besides running, and it’s really better than nothing. So, beak trimming in my book is a big no no, and I would completely avoid it. So, that’s this week’s podcast, and I hope you’ve enjoyed learning about fruits chickens can eat, jersey giants, how to deal with chickens and aggressive dogs and beak trimming. Thanks for listening to this episode of What The Cluck? !, and I’ll see you next time! What is your burning chicken question? Leave a comment below! If you wonder what fruit chickens can eat, how to deal with aggressive dogs, whether Jersey Giants are a good dual purpose breed, and about beak trimming, then this podcast is for you. Hi Maureen, sure, I’ll try to do that! Glad you like the transcripts! Looking forward to raising my own chickens and I like what I’m reading.